Successfully Added External Battery Case for iPhone 6 And iPhone 6s - 7000mAh Battery Capacity, 4 LED Power Indicators, USB Out Port to your Shopping Cart. Power through any battery problems with the 7000mAh external battery case for your iPhone 6 or iPhone 6s. The compact and lightweight case will always have your iPhone’s back, letting you get the most out of your beautiful phone. With the super powerful external battery case, your iPhone will never know any battery troubles. You will have the massive 7000mAh backup battery at your service that is simply mounted onto the back of your phone and will give your device extra juice whenever needed. Designed as a case for your iPhone 6 or 6s, it will not only give you extra battery power, but also offer your phone additional protection. A nice extra feature is a USB port on the side of the battery case. 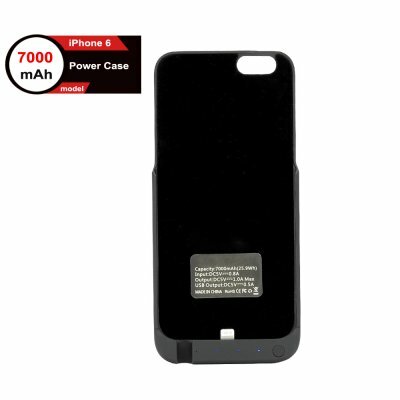 With it, you can use the 7000mAh battery to power up other small gadgetry by simply hooking them up to your iPhone case. So, with the battery case you won’t only solve all battery troubles for your iPhone, but will also be able to use it as a powerbank for other devices. The 4 LED power indicators will give you battery status updates and timely notifications when it’s time to charge up the battery case. Despite its large capacity, the battery case and light and compact and well-suited for everyday use. To charge up the battery case, simply use your iPhone 6/6s compatible “lightning” charging cable. The External Battery Case for iPhone 6/iPhone 6s comes with 12 months warranty. Brought to you by the leader in electronic devices as well as wholesale external battery cases, Chinavasion..